You probably didn't know that Lynne Cheney, wife of the vice president, has a job apart from her role of second lady. National Correspondent Thalia Assuras spent some time this week with Mrs. Cheney at work away from the vice president's residence. She doesn't get to work like the rest of us. There's the limo, of course, and that Secret Service squad. But make no mistake about it: Lynne Cheney is no slouch. When asked if she is a regular kind of working gal, Mrs. Cheney says, "I think that's probably pretty accurate. I may be kind of a compulsive worker." 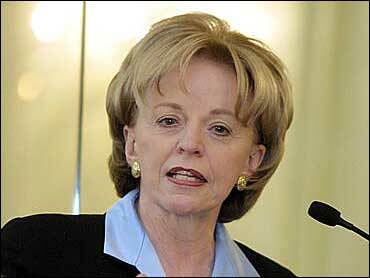 Lynne Cheney has worked most of her adult life. She's been a scholar at the American Enterprise Institute (AEI), a Washington D.C.-based think tank, since long before her husband became vice president. She explains, "It's a little like a university except we don't have students." She's also been a television commentator at CNN's "Crossfire," but one constant has been her writing. She says, "I like having done it and sometimes I like the process itself. I like it while I'm doing it, but sometimes it's very painful." She's the author of several books, including one children's book and another to be released this fall. What drove her into a career? "I have no idea," she says, "but I certainly had a role model. My own mother worked and she was a deputy sheriff, in fact. My grandmother always worked. She was an alteration lady at a dry cleaner." The work-anywhere flexibility of an academic's life relieved some of the pressures faced by other working mothers. She says, "My children talk about remembering my sitting at the dining room table writing. I don't think they ever understood what I was actually doing though until something that I had actually written appeared in one of their fifth grade textbooks, and then they suddenly thought: 'Well, maybe she's doing something worthwhile.'" Then there's her other occupation as the vice president's spouse, a job that she says comes with a set of expectations. She notes, "People like to have me come places and do things. It's also given me a platform to talk about important issues such as the great gaps in knowledge that our children have about history." What she does not see herself as is adviser to the vice president. She says, "We certainly do talk about the issues of the day, but I never think of myself as having particular insights to offer him." Still, she certainly has opinions on teaching history to children. She says, "We have to take this responsibility." And on why the United States is reviled in some parts of the world. She notes, "It used to be that there were two great superpowers vying. Now there's simply one superpower and when you're feeling as though your life isn't going as well as it should, it's natural for people to direct their resentment at the United States." The institute's director, Christopher DeMuth, says, "She brings what all of the other top scholars bring at AEI, which is a high degree of intelligence, a deep background in a particular field, but great practical sense." He says Mrs. Cheney didn't change after becoming the second spouse. "There was never any doubt in her mind that she wanted to continue to have a career of her own outside of the White House and outside of the government," says DeMuth. And just because she is married to the vice president, she says she does not get any special treatment at work. She adds, "I mean, my office is as small as anyone's. I didn't get new carpeting until everyone else did." So what does she like best, being the vice president's spouse, or working? Mrs. Cheney says, "It's just a wonderful combination because people will actually pay attention to the results of my research endeavors and it's very nice when you're able to bring those ideas before a wide audience." For Lynne Cheney, the perks and privileges of one job may help her make even greater gains in her other occupation.